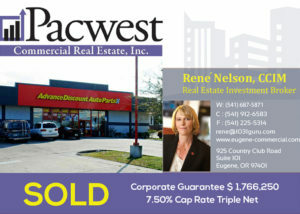 Part of a nation chain with more than 5,000 stores, Advance Auto is a perfect example of a great triple net tenant. And great tenants make great triple net properties, offering long-term corporate guarantees and stable income streams. With more than 74,000 employees, Advance Auto is the largest aftermarket automobile parts supplier in the United States. 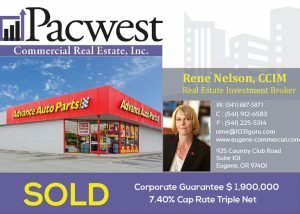 Put the professionals at Pacwest to work for you; call us at 541-912-6583 today, and get started realizing your investment goals. Please SelectMarket Overview for Lane County - Industrial SectorSmart Investment Strategies for the RecessionIs Now the Time to Sell Your Student Housing Rental Property?